Colonization of tooth surfaces by bacteria is an important etiological factor in the most common oral diseases - dental caries, gingivitis and destructive periodontal diseases. The literature is replete with studies establishing Streptococcus mutans as a major player in the formation of pit and fissure caries in the primary, mixed and permanent dentition and that the amount of mutans streptococci in the saliva is related to the number of colonized surfaces. , Therefore, decreasing the concentration of mutans streptococci in the oral cavity would have a great benefit with respect to decreasing the incidence of dental diseases. Saltwater rinses are a very archaic, yet effective, way of killing the bacteria in the mouth. The efficacy of saturated saline rinses lies in the scientific concept behind a diffusion gradient, which leads to dehydration and death of bacteria. Saltwater rinse is a commonly used age-old antibacterial measure. Long prescribed by physicians for sore throats, saturated saltwater rinses have never truly become mainstream, probably because of the unfavorable taste. A recent investigation by White and Armaleh found significant reductions in salivary bacterial counts with daily saturated saline rinses in adults. There is a scarcity of studies on saturated saline rinses in the dental literature, especially with respect to their ability to reduce salivary mutans streptococci in children. Decreasing the concentration of mutans streptococci in the oral cavity would have great benefit in reducing the incidence of pit and fissure caries. Thus, keeping in mind the potential antimicrobial effects of saturated saline and alum solutions, the present study was attempted to compare and evaluate the effects of saturated saline rinse and 0.02 M alum mouthrinse on salivary mutans streptococci levels in children. The investigation was a double-blind, stratified comparison of three parallel groups of children who used either a saturated saline rinse, a 0.02 M alum mouthrinse or a distilled water (placebo) rinse twice daily under professional supervision for a 21-day period. Subjects in the age group of 9-12 years. At least four restored decayed and/or missing teeth (DMFT/dmft ≥4). Subjects adhering to a twice-daily tooth brushing routine (using toothbrush and nonfluoridated toothpaste) and practicing no other oral hygiene measures, both professional and home based, other than the requisites of the research project. No history of current or recent (at least for the past 1 month) antibiotic usage. No abscess, draining sinus, cellulitis or other conditions requiring emergency dental treatment. No fluoride mouthrinse program currently being practiced in the school from which the participants are chosen. 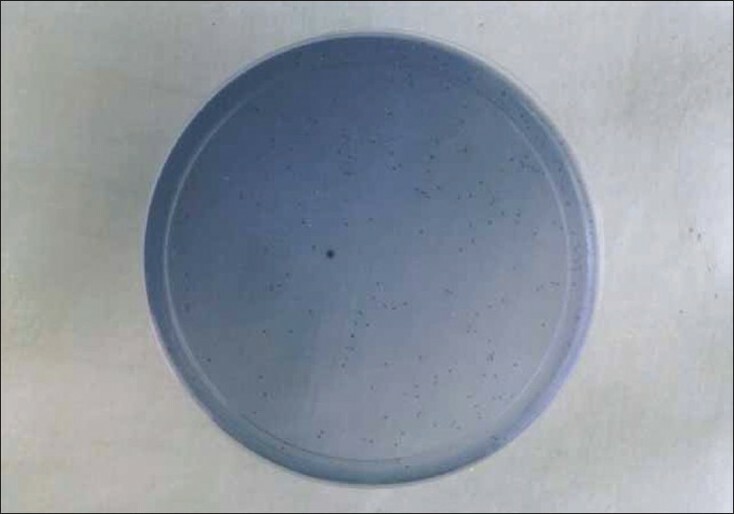 Group II: 0.02 M alum mouthrinse - a solution containing 0.02 M 0.885% hydrated aluminum potassium sulfate in distilled water at a pH of 3.6. Group III: Distilled water rinse (placebo rinse). A monitor trained to instruct the subjects and to assist them to perform the various oral hygiene procedures directly supervised the treatment regimen. The procedures were performed twice daily (once in the morning after breakfast and once after the evening meal). The beakers containing the mouthrinses were coded and the data was decoded at the end of the investigation [Figure 1]. 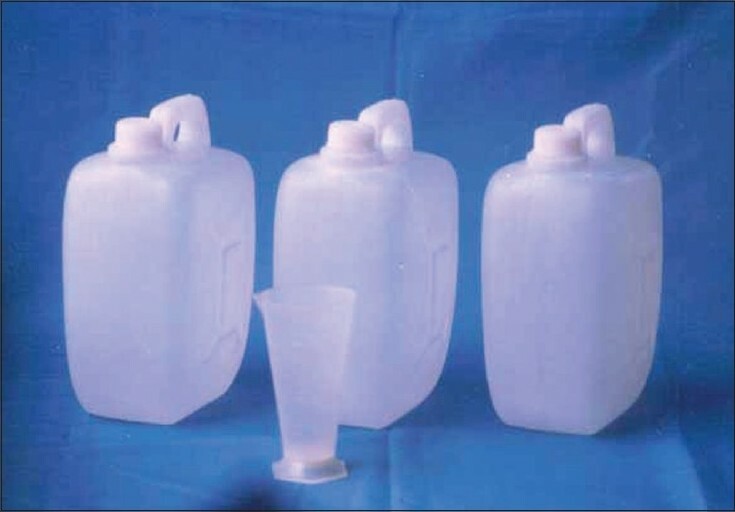 The monitor measured 10 ml of the rinse into disposable cups. The subjects performed an oral rinse by swishing the 10 ml of the solution in the mouth for 30 s twice daily [Figure 2]. After rinsing, the subjects expectorated into the cups and placed them in a waste can. The subjects were instructed not to eat/drink/rinse for 30 min thereafter. Clinical assessments were performed at the residential school by a single examiner using portable dental operatories and accepted methods of infection control [Figure 3]. The monitor coded the study subjects from 1 to 45 before clinical examination and saliva collection by the examiner to ensure that at no time was the examiner aware of the group assignment of any subject. The data was later decoded at the end of the investigation. At each examination, paraffin-stimulated whole saliva samples were collected in sterile bottles in the mid-morning with no eating/drinking for 2 h prior to the sampling. The child was asked to chew a piece of paraffin wax for 2 min after which the child expectorated the accumulated saliva into the sterile bottle [Figure 4]. 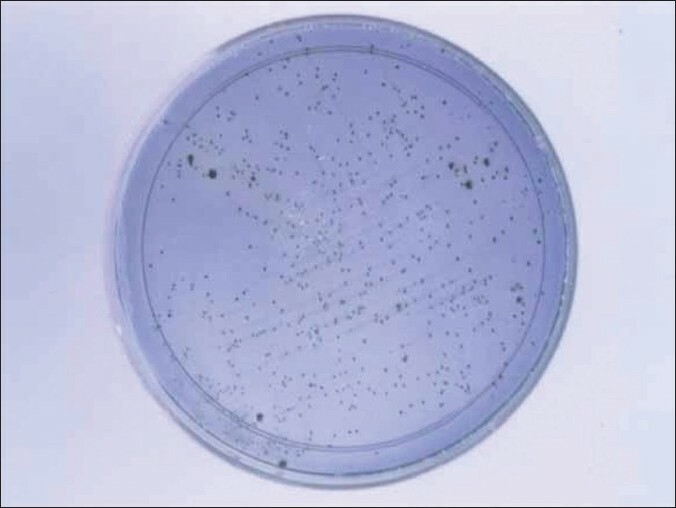 No transport medium was used as culturing was performed within 0.5 h of collection of the samples. The samples were then subjected to microbiological analysis. Saliva samples were obtained from each individual initially, prior to the start of the experiment, to establish baseline mutans streptococci levels. 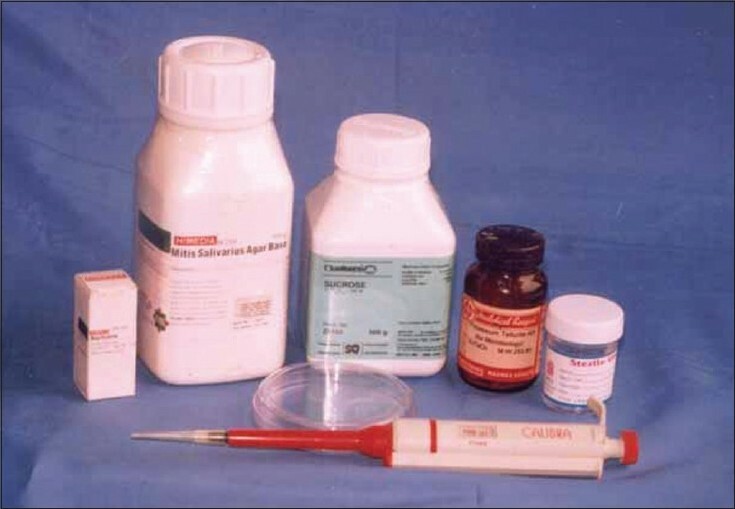 Subsequent samples were obtained 10 days and 21 days (3 weeks) after the start of the experiment. Thus, a total of three saliva samples were taken from each individual. 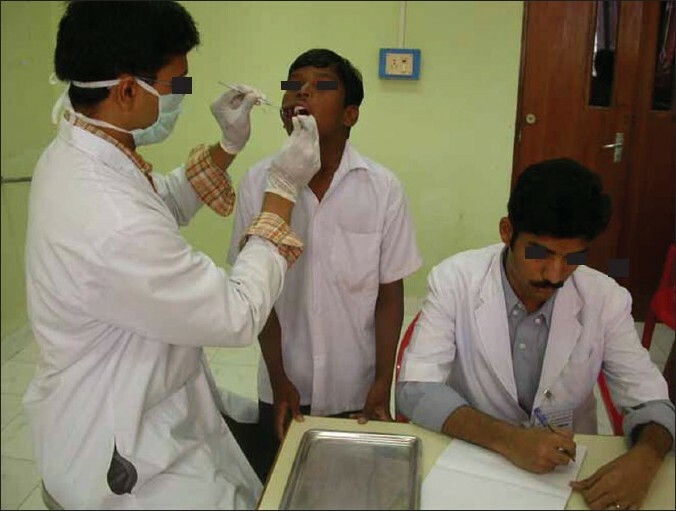 At each visit, subjects were questioned and an intra-oral examination was performed to detect adverse or unusual reactions such as desquamation, extrinsic staining or unpleasant taste. The size, site and severity of any lesions or aberrations and tentative diagnosis, if possible, were recorded. A judgement was made as to whether or not any abnormalities were attributable to any of the test materials. All the data was entered into a database on Microsoft Excel and analyzed using SPSS software with two-way ANOVA (for overall group mean comparisons), Wilcoxon's Signed Ranks Sum Test (for intragroup comparison of differences between baseline, 10 th day and 21 st day examinations (for salivary mutans streptococci counts) and Mann-Whitney "U" test (for intergroup comparisons of salivary mutans streptococci counts). The sample characteristics of the study population are presented in [Table 1]. The mean salivary mutans streptococci counts of all the groups at baseline, 10 th day and after 21 days are shown in [Table 2]. Comparison of the differences in salivary mutans streptococci levels between baseline and 10 th day, baseline and 21 st day and between 10 th day and 21 st day are presented in [Table 3]. Children using a saturated saline rinse and alum rinse showed statistically significant reductions in salivary mutans streptococci counts after 10 days and also after 21 days. Significant results were also obtained when comparing the results between 10 th day and 21 st day. However, children using distilled water rinse (control group) exhibited no significant reductions in salivary mutans streptococci counts after 10 days and even after 21 days when compared with the baseline. No significant difference was found between the 10 th day and the 21 st day. The intergroup comparisons of the salivary mutans streptococci counts at baseline, 10 th day and 21 st day are presented in [Table 4]. No significant difference in salivary mutans streptococci levels was observed between groups I, II and III at baseline and after 10 days. After 21 days, groups I and II showed statistically significant differences over group III. Again, group II showed a statistically significant difference over group I. The results of this clinical trial showed that both saturated saline and alum rinses (groups I and II) exhibited significant reductions in salivary mutans streptococci counts when the baseline values were compared with the posttreatment values after the 10 th and 21 st days. These results showed that there is a definite decrease in the salivary mutans streptococci levels even within 10 days of regular practice of the adjunctive oral hygiene measures under study. The control group, however, did not show any significant change when the 10 th day and 21 st day values were compared with baseline values, showing that the distilled water rinse did not have any significant effect on the salivary mutans streptococci counts. Among the experimental groups, the alum rinse group showed a statistically significant difference over the saturated saline rinse group. Thus, in the present study, alum rinse emerged as the most effective adjunctive oral hygiene measure in reducing colony counts. The results of the present study are in agreement with those of White and Armaleh (2004), who compared the efficiency of tongue scraping, saturated saline rinse and Listerine strips in reducing the salivary mutans streptococci levels. They found that all the treatment groups showed a significant reduction in colony counts from baseline to one or more posttreatment periods. Olmez et al. and Mourughan and Suryakanth studied the effects of an alum-containing mouthrinse (0.002 M alum) on the salivary levels of oral Streptococci and observed a significant reduction in the counts of oral Streptococci. , The findings reported by these authors are comparable to the reductions obtained with the alum rinse in the present study. Age is a critical factor in subject selection for many reasons, of which the most important is the number of tooth surfaces at risk. Subjects with a mean age of approximately 11 years were chosen because they were entering a period of high caries activity, with many permanent teeth erupting. Subjects with either rampant tooth decay or very poor oral hygiene were also included in the study as it was important to determine whether the protocol remained effective for all ranges of hygiene with different baselines for salivary mutans streptococci. As the present study was conducted in a residential school for boys, female subjects could not be selected. However, epidemiological studies in caries prevalence have not shown any significant difference in the caries susceptibility of boys and girls at an average age. Because our study was conducted in a residential school, all the subjects consumed the same diet during the period of investigation. As diet (an important factor in dental caries) was controlled in our study, the different experimental procedures were possibly given the best chance of demonstrating their efficacy against salivary mutans streptococci. The oral hygiene measures used in our study were simple, could be carried out fast and the benefits for most children far outweighed the small investment and time required to accomplish the procedure. Our study was designed to simulate a realistic home regimen in which the subjects rinsed for 30 s twice daily while continuing their normal twice-daily tooth brushing routine. In this context, it is noteworthy that the reductions in salivary mutans streptococci in our study occurred in addition to the effects of daily tooth brushing. Because the study was completed without observing any indications of negative effects resulting from mouthrinse use, and were well accepted by the children who took part in the experiment, the rinses appear safe for long-term oral use and are worthy of further study for potential applications in the practice of Preventive Dentistry. Groups I and II (experimental groups) showed statistically significant reductions in salivary mutans streptococci levels on comparison of the data obtained at baseline, 10 th day and 21 st day. Group III (control group) did not exhibit any significant reduction in salivary mutans streptococci levels. Among the two adjunctive oral hygiene measures that were evaluated, alum rinse (group II) was the most effective in reducing the salivary mutans streptococci levels. Dr. Joby Peter, MDS, (Senior Lecturer, Department of Pedodontics, Rajah Muthiah Dental College and Hospital) and Ms. Arularasi Aparna (Microbiologist, Rajah Muthiah Dental College and Hospital) are thanked for the invaluable assistance throughout the duration of the study and for the expertise rendered in the microbiological procedures, respectively. 1. Axelsson P, Kristofferson K, Karlsson R, Bratthall D. A 30-month longitudinal study of the effects of some oral hygiene measures on Streptococcus mutans and approximal dental caries. J Dent Res 1987;66:761-5. 2. White GE, Armaleh MT. Tongue scrapping as a means of reducing oral mutans streptococci. J Clin Pediatr Dent 2004;28:163-6. 3. Tencate JM, Marsh PD. Procedures for establishing efficacy of antimicrobial agents for chemotherapeutic caries prevention. J Dent Res 1994;73:695-703. 4. Wei SH. Conference report: Special symposium; scientific update on fluoride and public health. J Dent Res 1990;69:1343-4. 5. Bihani SN, Damle SG. Evaluation of an alum-containing mouthrinse on plaque and gingivitis inhibition over 2 weeks of supervised use. J Indian Soc Pedod Prev Dent 1997;15:34-8. 6. Kleber CJ, Putt MS. Aluminium and dental caries: A review of the literature. Clin Prev Dent 1984;6:14-25. 7. Simonssen T, Glantz PO, Edwardsson S. Effects of cations on the colloidal stability of some oral bacteria. Acta Odontol Scand 1988;46:83-7. 8. Olmez A, Can H, Ayhan H, Okur H. Effect of an alum­ containing mouthrinse in children for plaque and salivary levels of selected oral microflora. J Clin Pediatr Dent 1998;22:335-40. 9. Mourughan K, Suryakanth MP. Evaluation of an alum containing mouthrinse for inhibition of salivary Streptococcus mutans levels in children: A controlled clinical trial. J Indian Soc Pedod Prev Dent 2004;22:100-5. 10. Brambilla E, García-Godoy F, Strohmenger L. Principles of diagnosis and treatment of high caries risk subjects. Dent Clin North Am 2000;44:507-40. 11. Gold OG, Jordan HV, van Houte J. A selective medium for Streptococcus mutans. Arch Oral Microbiol 1973;18:1357-64. 12. Wan AK, Seow WK, Walsh LJ, Bird PS. 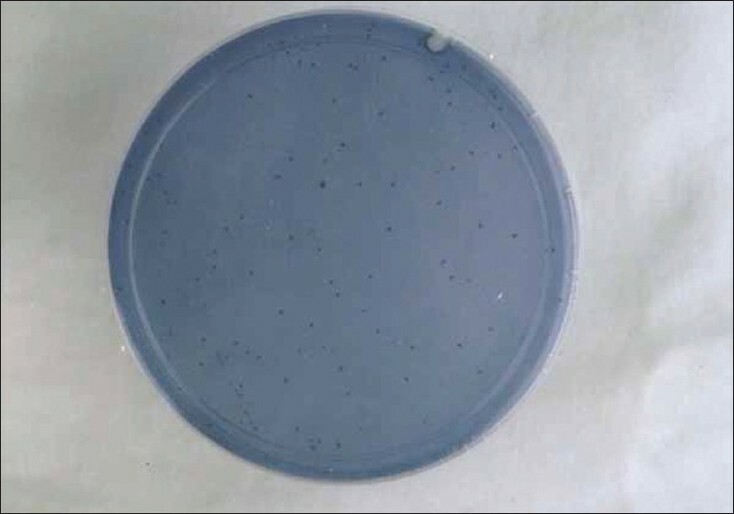 Comparison of five selective media for the growth and enumeration of Streptococcus mutans. Aust Dent J 2002;47:21-6. 13. Putt MS, Kleber CJ, Smith CE. Evaluation of an alum containing mouthrinse in children for plaque and gingivitis inhibition during 4 weeks of supervised use. Pediatr Dent 1995;18:139-44. 14. Kleber CJ, Putt MS, Smith CE, Gish CW. Effect of supervised use of an alum mouthrinse on dental caries incidence in caries­ susceptible children: A pilot study. ASDC J Dent Child 1996;63:393-­493. 15. Wyne AH, Guile EE. Caries activity indicators: A review. Indian J Dent Res 1993;4:39-46. 16. Klein H, et al. The epidemiology of dental disease. U.S. Public Health service, 1948. In: Finn SB, editor. Clinical Pedodontics. 4 th ed. Philadelphia: W.B. Saunders company; 1999. p. 454-74. Koletsi-Kounari, H. and Mamai-Homata, E. and Diamanti, I.
Antonio, A. and Iorio, N.P. and Farah, A. and Dos Santos, K.N. and Maia, L.